Activation of portfolio opens up lots of information upfront in very easy format. The specialized format of report has been designed in a way once user get familiar with it then it just takes few seconds to understand impact and action required. In nutshell, even we have provided all piece of information at our website it will take typically 2-3 hours' time for a regular investor to scan through all stocks status where (s)he has taken exposure. In spite of that chances are very high to miss out macro factors like limit on exposure per stock, overall net worth, cash flow etc. Above color coded format has lots of information which user grasp just in few seconds after getting familiarize with the system. To know the details about color coding system Click here. 1. 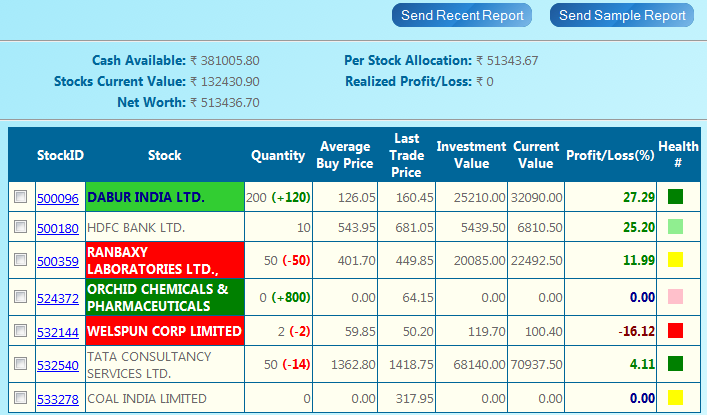 Active portfolio convey visually which one to buy and which one to sell (Red means sell and Green means buy). 4. Active portfolio sends reports to user email ID (and secondary email ID) on weekly basis and SMS alert too. So, it is truly active, user don't need to chase but it will. 5: Users can order their own report on demand (see extra button Send Recent Report).